While user interface (UI) prototyping is generally considered useful, it may often be too expensive and time-consuming. This problem becomes even more severe through the ubiquitous use of a variety of devices such as PCs, mobile phones and PDAs, since each of these devices has its own specifics that require a special user interface. Instead of developing UI prototypes directly, we propose specifying one interaction design from which UIs can be automatically generated for multiple devices. Our implemented approach uses communicative acts, which derive from speech act theory and carry desired intentions in interactions. 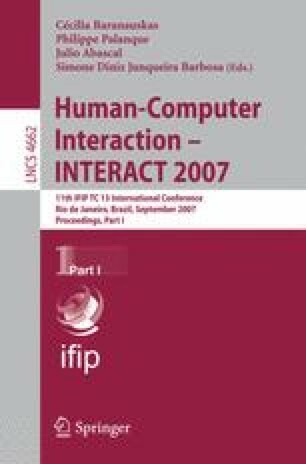 Models of communicative acts, UI domain objects and interaction sequences comprise interaction design specifications in our approach and are based on a metamodel that we have defined. We support the development of such models through an IDE, which is coupled with the UI generator. This allows a new form of UI prototyping, where the effects of each model change can be seen immediately in the automatically generated UIs for every device at once.